Long term-experiments in Wisconsin and Minnesota have demonstrated that kura clover will persist for 20 years (and counting) and can be a truly permanent component of a pasture or hayfield. It has survived winters that damaged adjacent alfalfa and red clover fields. It is the last plant to die around water tanks or mineral feeders in pastures. Fatal diseases of kura clover have not been observed. Furthermore, fiber levels of kura clover are consistently lower and protein and digestibility consistently greater than other legumes (with the exception of white clover) and grasses used as forage in the Great Lakes Region. So, how can we employ this unique legume on farms in the Great Lakes Region? Three means to capitalize on the unique characteristics of kura clover have been investigated in Wisconsin and will be discussed. Increased forage yield is often a result of applying nitrogen fertilizer to grasses or of growing grasses in mixture with legumes without addition of fertilizer N. Frequently, monoculture grass fertilized with N yields more than a mixture of the same grass with legumes. In a field study conducted over three growing seasons at two locations, we found that Kentucky bluegrass, smooth bromegrass, and orchardgrass fertilized with 300 pounds per acre on N (split applied at three times) yielded more than these same grasses grown in mixture with either kura clover or birdsfoot trefoil (Table 1). Depending on the grass, these legumes resulted in an average fertilizer N replacement value (FNRV) offrom 83 to 240 pounds per acre over these six environments. In this study, all forage was clipped and removed three times per season, and we would expect that the N replacement value would be much greater in a grazed pasture where most of the forage N would be returned in urine and feces. The N contributed to the system by legumes is of course free, and it’s value will fluctuate with the price of N fertilizer. The FNRV relates only to dry matter production, but the positive effect of legumes in mixture with grasses on animal performance has also been well documented. Generally, the greater the nutritional demands of the animal (dairy cows or stocker steers vs. beef cows for example), the greater the response to addition of a legume. We used the spreadsheet MILK90 to calculate the potential milk production from nitrogen fertilized grass monoculture or the same grass grown with kura clover or birdsfoot trefoil. Despite greater dry matter production from N fertilized grasses, the potential milk production per acre from grass/legume mixtures was always equal to or greater than monoculture grass. This is a result of very high forage quality of both kura clover and birdsfoot trefoil compared to grasses. When we looked at the data closely, it was clear that potential milk production mirrored the proportion of legume in the mixture. Furthermore, the proportion of legume decreased from the first year (this was actually the year after planting) to the third year in birdsfoot trefoil / grass mixtures and increased over this period in kura clover / grass mixtures. Therefore, both the long-term potential milk production and FNRV of kura clover would likely exceed that of birdsfoot trefoil or other short lived legumes in mixture with grasses in our environment. Legumes usually improve animal performance when they are added to grass pastures, but poor persistence limits their long-term presence in densities high enough to make an impact. On many farms in the Great Lakes Region, frost seeding of legumes, especially red clover, into pastures in spring is a practical means to keep legume densities at reasonable levels. This practice requires some management skill and abundant early summer rainfall, and usually is successful about 60% of the time. We compared performance of Holstein steers on grass pastures frost seeded each spring with red clover to performance on pastures with a grass/kura clover mixture over a 3-year period. Grasses in the pastures included smooth bromegrass, orchardgrass, Kentucky bluegrass, and lesser amounts of reed canarygrass, tall fescue, and quackgrass. We used four six-acre pastures allowing us to replicate each treatment twice. Sixteen 450-pound steers were introduced to each pasture in mid-April and steer numbers were reduced as animals grew and soil moisture and forage production decreased into the summer and autumn. Pastures were divided into six paddocks and cattle made six to nine complete rotations through each pasture each season. Grazing was terminated in September or October, depending on forage availability. Kura clover persisted in the pastures very well, actually increasing relative to the amount of grass present. The proportion of kura clover in the pastures generally was greater than 50% and that of red clover less than 40%, despite addition of 6 pounds of red clover seed each spring. Steer gain, average daily gain and carrying capacity were greater for kura clover/grass pastures compared to red clover/grass pastures each season and averaged over the three seasons (Table 3). 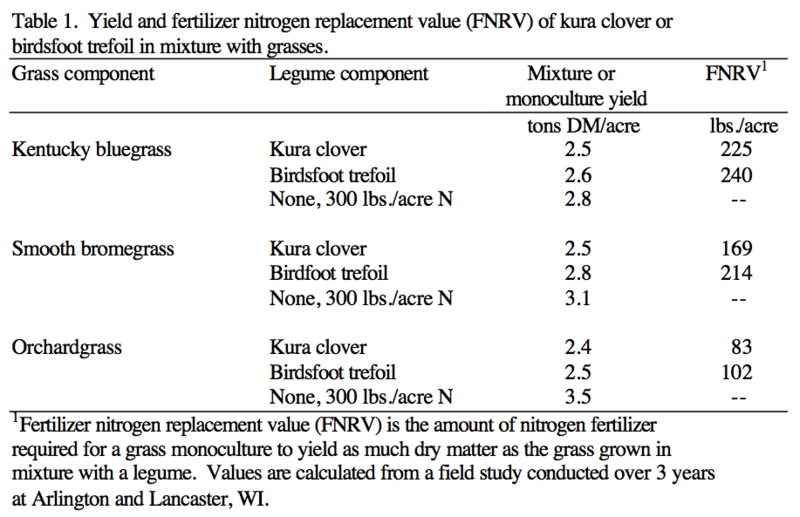 Superior animal performance on mixed-grass pastures containing kura clover was associated with greater total forage yield, clover proportion, and nutritive value compared to red clover/grass pastures. An observation that we made over the entire 6-year term of grazing these pastures (the legumes were added in 1995, and grazing was initiated in that season) was differential grass response. Orchardgrass, reed canarygrass, and tall fescue increased or remained constant and Kentucky bluegrass and smooth bromegrass decreased with time in the pastures that contained kura clover. This change was not observed in the red clover pastures. In another experiment, we observed dominance of kura clover over Kentucky bluegrass after 2 years of grazing. It has become apparent that care must be taken to manage pasture mixtures to favor the grass and that aggressive grasses will be most compatible with kura clover over the long-term. On mixed crop-livestock farms, soil erosion control is achieved primarily through forage-based cropping systems supplemented by cultural and mechanical practices. Crop rotation incorporating several years of alfalfa followed by 1 or 2 years of corn occupies 6 million acres in Wisconsin, and soil losses during the years of established alfalfa are minimal. However during the years of corn production and the year of alfalfa establishment, soil losses can be unacceptably high. Removing the entire corn plant as silage and leaving the soil unprotected during the autumn, winter and spring, a common practice on dairy farms, can further exacerbate this. In 1996 we initiated research to develop and test a living mulch system for corn production that would provide permanent ground cover and soil protection similar to that observed in established alfalfa. What is a Living Mulch? Living mulches are plants, intercropped with a row-crop, that can decrease erosion, increase water infiltration, suppress weeds, reduce insect pests, and in the case of legumes, supply nitrogen. The mulch can be an annual or perennial plant inter-seeded with corn or another cash crop, or it can be an existing perennial grass or legume stand into which corn or another crop is sown. The latter system usually requires suppression of the existing “living mulch” crop with herbicides or cultural practices to create what has been referred to as a “sleeping sod”. Although living mulches have been used in production of various cash crops – including ground cover in apple orchards – suitable systems for row-crop production in the northern USA have not been developed. Attempts to use alfalfa as a living mulch for corn production have met with limited success because of competition for water, light and nutrients. In addition, alfalfa has a relatively short life span – often in the range of 3 to 5 years – thus requiring frequent replanting. Crownvetch, a rhizomatous legume planted on Wisconsin roadsides to stabilize embankments, has shown promise in Pennsylvania because it typically offers less competition than alfalfa to corn. But crownvetch has limited value as a forage crop and does not recover rapidly the year after corn production. Our first experiments in 1996 and 1997 demonstrated that corn could be grown in a kura clover living mulch, after killing bands of kura clover with a broadleaf herbicide or broadcast suppression of the clover with a low rate of Roundup. But grain and silage yields were lower than monoculture corn and varied markedly across four different environments. Recovery and competition from kura clover varied depending on spring and early summer weather conditions and it became obvious that flexibility to apply additional suppression as needed was necessary to make the system work. Our next experiment was designed to evaluate herbicide resistant corn technology in a kura clover living mulch system. 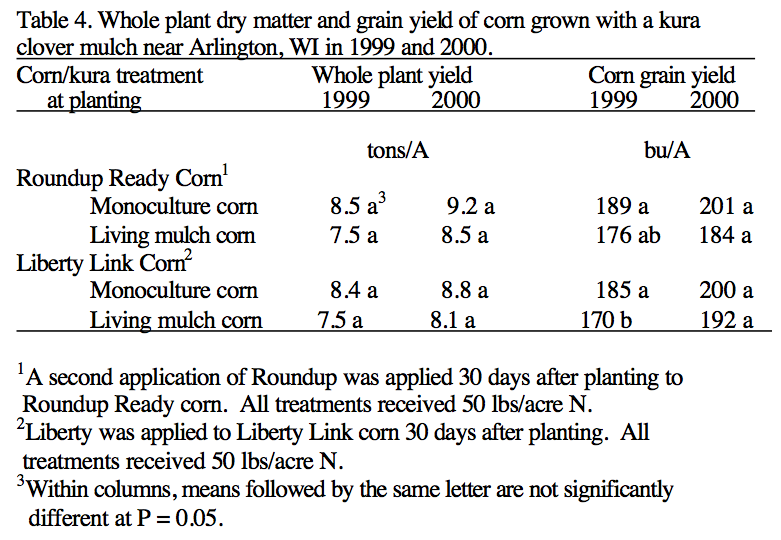 In spring 1999 and 2000, Roundup Ready and Liberty Link corn was no-till drilled into established kura clover that had been totally killed (monoculture corn) or killed only in 10-inch bands over corn rows plus inter-row suppression with a low rate of Roundup (living mulch corn production). Post-emergence suppression of kura clover and weeds was accomplished by application of Roundup or Liberty, depending on the corn hybrid, about 30 days after planting. Whole plant and grain yield data presented in Table 4 reveal that either Liberty Link or Roundup Ready hybrids, with their companion herbicides, provide flexibility needed to reliably control kura clover and weed competition in the living mulch system. Furthermore, kura clover recovered to full production by June the year after corn production. These systems with herbicide resistant technology seem to have overcome all previous limitations of using kura clover as a living mulch for corn production, but we will continue to fine-tune rates and timing of suppression treatments. Our results show that with adequate suppression, kura clover can be managed as a living mulch in corn with little or no reduction in corn whole-plant (silage) or grain yields, and that kura clover will recover to full production for pasture, silage, or hay the following season. Close monitoring and careful control of kura clover competition is required to maintain high corn yields in this system, and new herbicide resistant corn hybrids provide additional options for post-emergence control of clover competition. There is greater risk of corn yield loss associated with very early planting dates because established kura clover is less inhibited by cool weather than newly planted corn and could obtain a competitive advantage. In particularly cool springs, subsequent suppression of kura clover should be promptly applied in order to prevent delayed corn seedling development that may arise if legume growth proliferates. A system that incorporates band-killing kura clover over the corn row and suppression of kura clover in the inter-row space has provided consistently good performance in terms of corn production and kura clover recovery after corn harvest. Although there are still many management questions to be investigated, we believe that a kura clover-living mulch system could be largely nitrogen self-sufficient, result in year-round groundcover, leave less opportunity for weed invasion, require less tillage, and reduce soil erosion compared to conventional systems. The system should be applicable anywhere alfalfa-corn rotations are now used and especially where slope and soil erosion is a problem, such as in the unglaciated portion of the Upper-Mississippi Valley. With increasing amounts of corn silage in dairy rations, a kura clover mulch in place after complete removal of all corn residue from a field would also be an advantage. In situations where corn grain is harvested and the stover is grazed by cattle in late autumn, a kura clover mulch has potential to be a protein supplement and allow better utilization of the low quality corn stover. Although none of these suspected benefits of a kura clover living mulch have been demonstrated on a large scale or over an extended period of time, they do seem logical based on previous research and observations with other cropping systems. Additional testing of the agronomic and environmental benefits of this system in research trials and on-farm is in progress and must be completed before kura clover living mulch can be included in the “bag of tools” available to farmers striving to be profitable while protecting erosion prone soils in the Great Lakes Region.